The most viewed programme in American cable history and applauded by critics and fans, The Walking Dead is an international phenomenon, and yet its hardy survivors have only just ventured out of Georgia. There’s a whole lot of walker-infested territory to explore, and so a spin-off series was perhaps inevitable. The six-episode first season of Fear the Walking Dead takes us to Los Angeles, back at the beginning of the outbreak. Madison Clark (Kim Dickens) is a high school counselor, her partner Travis (Cliff Curtis) a teacher – ordinary jobs in an ordinary world. And then a suspicious flu outbreak closes the school, and Madison’s junkie son believes he’s seen a dead girl rise. 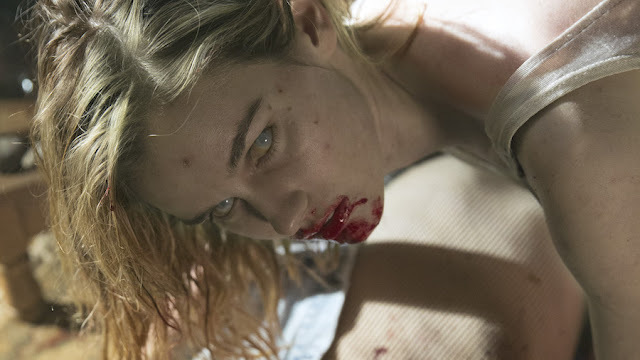 It’s a slow-burning series, which may not be to everyone’s tastes compared to the action-packed Walking Dead, but there’s a lot to appreciate in the way it builds up paranoia and fear. Particularly interesting is the relationship between the civilians and the military, who set up camp in LA claiming to be protecting the people but become increasingly controlling and secretive – it’s a trope that’s been done in zombie fiction before, but one that works well here. Where the series falters is in the characters of Madison, Travis, and their families, who aren’t as well defined as they need to be, often acting out of character in order to serve the plot – who does what in several scenes is very interchangeable, giving away the poor construction. Kim Dickens, who was impressive in Ben Affleck’s Gone Girl, is given particularly short shrift, with no clear arc to Madison’s character and often sidelined in favour of the male characters. At the heart of these problems is the decision to focus on one ordinary family, meaning they end up crowbarred into plots; a more ensemble approach allowing us to spend more time with, for example, the doctors struggling to deal with the deluge of patients and the lower-ranked soldiers questioning their orders, could have given a more compelling look at the collapsing society. There are lots of good ideas in this world, but Fear fails to dig deeply into them.